In the picture above north is at the top and the image covers 56.4 x 70.5 degrees. Image centre is located at 10:54:45.1, +49:15:50 (H:M:S, D:M:S, J2000) Astrometric data from Astrometry.net. Ursa Major is the third largest constellation in the sky but is not seen by skywatchers in the far southern hemisphere. 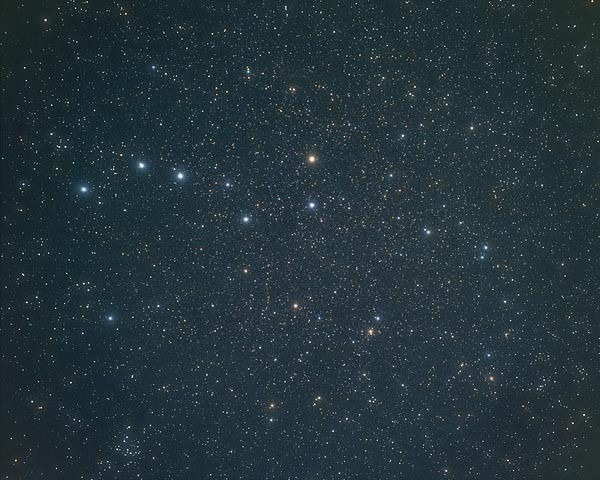 However, it is the most recognisable of all constellations for those who can see it, mainly because of the asterism formed by the seven brightest stars. This is known as the Big Dipper in the USA, the Plough in Britain, various kinds of carts in Europe and a range of other objects in other cultures. Not surprisingly the constellation as a whole has a rich mythology associated with it, with many peoples projecting their stories among these beautiful stars. Greatly abbreviated, one ancient Greek version has Zeus romancing Callisto. His wife Hera changed Callisto into a bear out of jealousy. Hera's son Arcus found Callisto (the bear) by chance in the forest and was about to kill her, so to save her, Zeus turned Arcus into a smaller bear (Ursa Minor), and threw the pair of them into the sky, causing their tails to be stretched. Both bears are circumpolar (visible throught the year) from latitudes north of about 10 degrees and Ursa Major is seen high above the pole star in the northern winter and below it (as in the photograph) in the summer. The two brightest stars in the constellation are Dubhe and Merak (α and β Ursa Majoris), also known as the Pointers because a line drawn through them points to Polaris, the North Star. The main objects of amateur astronomical interest in Ursa Major are galaxies, five of which have Messier numbers.